In this 2-hour DVD from bluegrass guitar veteran Tim Stafford you will learn the fundamental skills that will make you a better guitar player no matter what your current ability level. Tuning, Timing, Tone, Technique, and Taste are all essential skills that guitar players from beginners to professionals need to address on a regular basis. 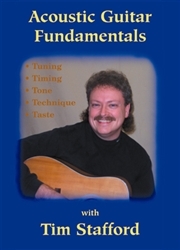 Tim's masterful presentation of these concepts and the practical, time tested methods he teaches you on this video will not only help you understand, improve and maintain these skills, but will advance your overall guitar skills considerably. This item is also available for digital download at Flatpick Digital Academy: Click here to Access that Web Site.